Ever heard hip hop from the Netherlands? inDepth first hooked up with Moonrocks (Bicasso & Nebulus) on the Europa CD. In 2003 they dropped their own full length. 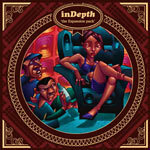 inDepth is Dj Syah and N(obody). All compositions by inDepth. All vocals by N(obody).